Rottweilers are predisposed to a number of conditions, a few of which we will discuss here. The size of Rottweilers leads them to share a number of joint/skeletal problems with other large breeds of dogs such as German Shepherds, Great Danes, Mastiffs etc. Normally the hip is a stable ball-and-socket joint. In cases of hip dysplasia, the socket is often too shallow and the ball too small or misshapen.This leads to an unstable joint which in turn can cause painful lameness early in life and progressive arthritis later in life. 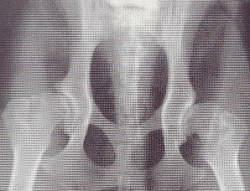 The causes of hip dysplasia are not yet fully understood, however a number of risk factors are involved. The condition may be inherited. It is wise to choose pups from parents who have had their hips X-rayed under the BVA (British Veterinary Association) Scheme and had scores deemed suitable for breeding. Under this scheme Xrays are taken of the hips by a Veterinary Surgeon and submitted to an independent panel of experts at the BVA who “score” each hip for abnormalities: the lower the score, the better hip condition. Rapid growth, weight gain and excessive strenuous exercise are all factors that can lead to hip dysplasia. This can be difficult to monitor as it is in the nature of young dogs to want to exercise and it is not possible to determine exactly how much exercise is too much. Common sense is required: do not run your dog to exhaustion every day, and any lameness should be evaluated by a Veterinary Surgeon. Your Vet may wish to Xray your dog’s hips to evalaute them, although hip dysplasia may not be fully developed until 12-18 months of age. It is difficult to make recommendations which will guarantee hip dyplasia will not occur and it is recommended you consult your Veterinary Surgeon for any further advice should you have any concerns. 3-18 months – there may be no symptoms, or there may be pain in the affected hips leading to lameness in one or both hind legs. Stiffness and reluctance to exercise is common. 18 months – In mild cases the symptoms seen earlier in life may settle down and the dog will lead a normal life for a number of years.In more severe cases the symptoms seen earler in life will continue or worsen. Middle to Old age – The affected hips are likely to become arthritic and may need medical or surgical treatment. 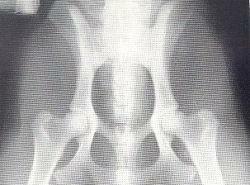 Treatment of Hip Dysplasia varies according to the dogs age and individual veterinary surgeons. Young dogs tend to be treated with a combination of anti-inflammatory drugs along with a balanced diet and moderate exercise. Most dogs settle down at approx 18 months of age. Otherwise various surgical options are available, some of which are specialist procedures. Older dogs tend to be treated with anti-inflammatory drugs, either intermittently or long term when necessary. More severe cases may be treated surgically. The anterior cruciate ligament is one of five major ligaments that cross the knee (stifle) joint to keep it stable.This can rupture (tear) partially or completely at any time in a dogs life causing lameness and progressive arthritis. 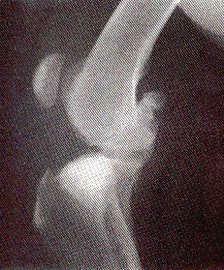 Lameness is the main sign on the affected knee. The lameness may be sudden or gradual in onset. Examination by your Veterinary Surgeon may reveal other signs which support the diagnosis, including pain, swelling and instability in the knee joint. There may be a noticeable “clunk” when the dog is walking in severely unstable joints. Often the dog will need to be sedated or anesthetized to be relaxed enough for the joint to be examined properly and Xrays may be taken to reveal the degree of arthritis in the joint. In the majority of cases of anterior cruciate ligament rupture in Rottweilers, the treatment of choice will be surgery to stabilize the joint. Occasionally in less severe cases, treatment may be with anti-inflammatory drugs, increased rest and a weight loss plan if necessary. Regardless of the treatment given, all affected dogs will develop arthritis in the knee joint to some extent afterwards. Osteochondrosis is common in young dogs in which normal cartilage development fails. More commonly in the elbow joint, although other joints can be affected, including the shoulder. 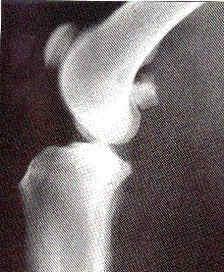 In the elbow this involves a fragment of the normal surface of the joint breaking away. In the shoulder this produces a defect in the joint surface on the head of the humerus. In both cases this leads to the surface of the joint being uneven and poorly fitting, which will progress to osteoarthritis in the affected joints over time. The causes of OCD are not yet fully understood. Most dogs exhibit symptoms initially between 4-8 months of age. The main sign will be lameness in the affected leg and/or stiffness after rest. The affected elbow/shoulder may be painful on manipulation though this is not always the case. Both elbows/shoulders maybe affected, even though only one maybe lame. Dogs may exibit the same symptoms when older due to osteoarthritis in the joint secondary to the OCD. Diagnosis of OCD is made by examination of the affected joints, often under sedation/anaesthetic, along with Xrays of the shoulder/elbow joints. OCD in its early stages can be very difficult to see on an Xray, even to the eye of an experienced Veterinary Surgeon. Therefore, a specialist’s opinion may be necessary. Treatment varies with the severity of the condition and the joint involved. Often the symptoms are only mild and will settle down after a while with rest, a balanced diet and anti-inflammatory drugs. Sometimes in more severe cases surgery may be performed to remove the damaged portion of cartilage. Regardless of which treatment is used, most dogs will go on to develop osteoarthritis in the affected joint later in life.